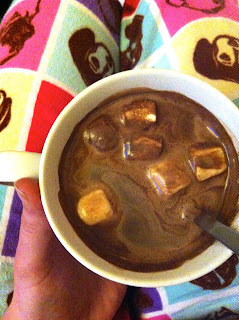 generously garnished with some vegan marshmallows, this hot chocolate was delish! and definitely assisted in exceeding my calorie quota for the day... but an enjoyable treat for a rainy night in all the same! combine the sugar and cacao in the bottom of a large mug. add a little non-dairy milk to make a paste, then slowly add the rest of the non-dairy milk to combine. place in the microwave for 2-3 minutes until hot. serve with vegan marshmallows and enjoy!